For many of our friends, this was a difficult winter, wasn’t it? For Nome, though Mother Nature can still throw in some surprises, we rejoice that May is the first month since October to routinely see daytime highs above freezing. And, by the end of the month, nighttime temperatures above freezing, too. We look to warmer temperatures, but we have to be realistic. There are only 29 days of the year, in July and August, on which Nome has never seen a freeze. We pray that your spring is going well, and we thank you most deeply for your support for our work. You touch thousands of hearts every single day, and we know that Our Lord will greatly reward you for your work on our listeners’ behalf. Thank you for your help. Thank you for your prayers. We greatly need them both. Thank you! FLASH! KNOM is being honored with the 2010 Religious Radio Station of the Year Gabriel Award! It’s our 18th top Gabriel! We’ll have details next month. Please pat yourself on the back! 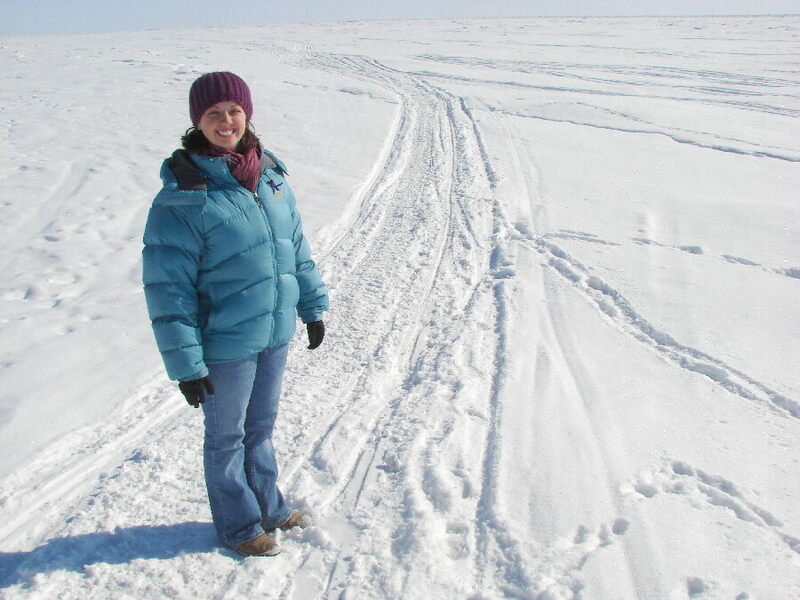 TRAILING: (left) KNOM volunteer education director Linda Maack stands in the middle of the Iditarod Trail on the Bering Sea ice on a sunny April day. The ice will still be solidly in place by the time you read this. Among other things in her busy life, Linda is an organizer for Nome’s Relay for Life, a May 22nd fundraiser to benefit cancer research. THANKS TO FR. 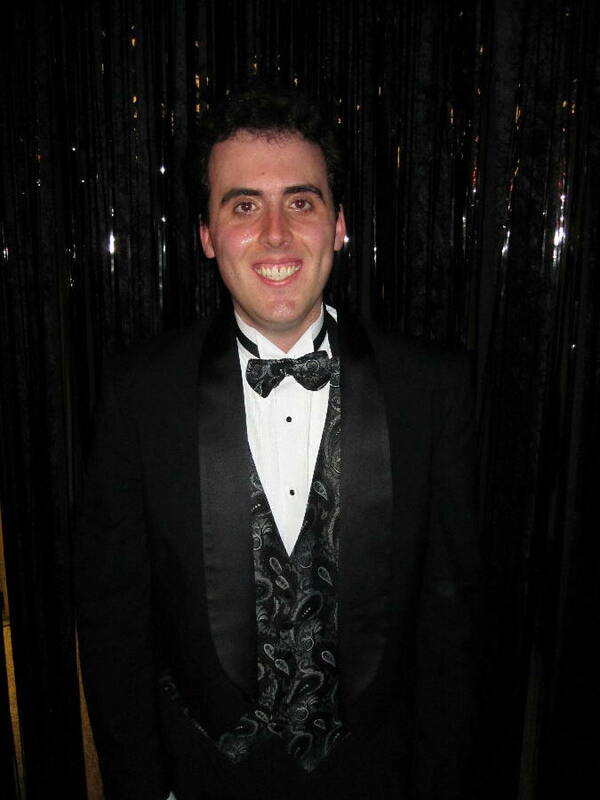 ROSS TOZZI, a former KNOM volunteer, now pastor of Nome’s St. Joseph Parish, for thoughtfully writing and voicing a Divine Mercy Chaplet Novena which aired beginning on Good Friday. KNOM program director Kelly Brabec produced the series. Recently, Fr. 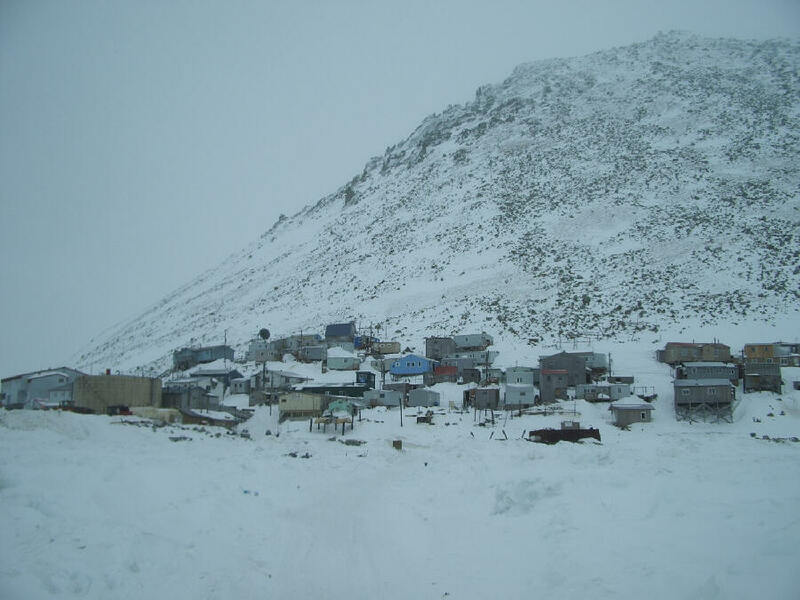 Ross was on the incredibly isolated island of Little Diomede in the Bering Strait, the first time the small Catholic congregation had seen a priest in over a year. Most Sundays, Diomeders gather in St. Jude, the village’s Catholic church, and pray along with the Mass as it is broadcast over KNOM. 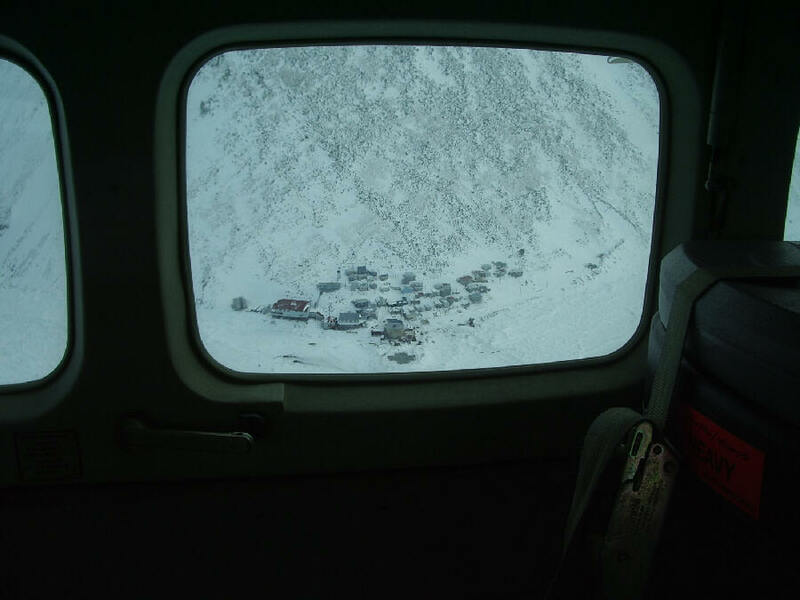 (Left) You can see how isolated Little Diomede's 128 souls are from these images taken by then-KNOM volunteer Jesse Zink in April 2006. They live an almost completely subsistence existence, that is, feeding their families by living off the land and especially the sea. With no flat land for an airstrip, ski planes bring visitors like Fr. 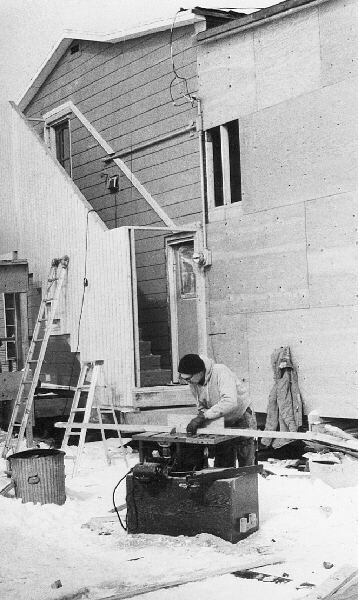 Ross and supplies, largely for the school, only during the winter, landing on the ocean ice. In summer, there may be the occasional helicopter. From the bottom picture, you can see that Little Diomede, on the right, is only 2-1/2 miles from Russian Big Diomede, with the International Date Line in between. You can bet that 100% of Little Diomede adults are daily KNOM listeners. INSPIRATIONAL SPOT: In many places that I seldom or never see, there are people hungry or without hope. Sometimes, when I’m not near them, I tend to forget about them. Sometimes I remember they’re there but I’ve not felt their troubles and they don’t seem real to me. Lord, help these people whom I do not know. Help me to help them. 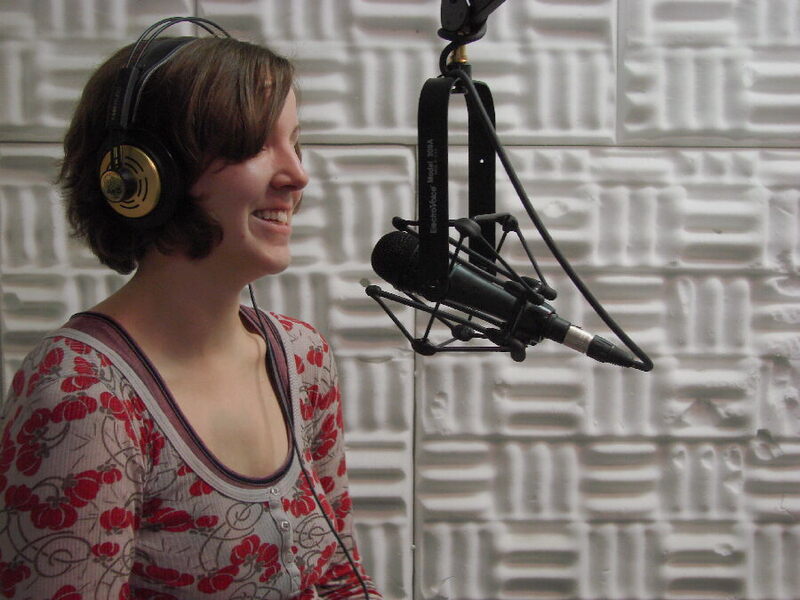 ALUMNA: (left) 2007-2009 KNOM volunteer Laura Davis filled co-host duties during a live call-in program recently. While she now works full time for Nome’s community college, it’s clear she’s lost none of her radio skills! HONORING MOM: Would you like to honor your mother by means of a gift to KNOM? If you send us her name and address, we will send her an acknowledgement card signed by everyone on the KNOM staff. If the contribution is in memory, we will prayerfully send the card to you, or to a person of your choosing. On Mothers’ Day, we will be praying for all of the mothers in the extended KNOM family. If you would like us to send a card, please let us know with a short note. COOL NEWS: While the easiest of Nome winters can be challenging to someone not accustomed to their brutality, the winter that’s about to end was relatively mild. Its coldest temperature was –35�. Many winters, the mercury dips much lower than that, and it has been known to drop to as low as –54�. Snow will probably remain on the ground into June, and it won’t be until June’s third week that we’ll see any green on the tundra. BREAKING THE ICE: It’s in late May and early June that western Alaska’s creeks and rivers “break up,” Alaskan jargon for thawing. Typically, the breakup begins at headwaters and works its way downstream. Most years, melt water will push immense volumes of broken ice forward, and the plates and chunks will form dams—or “jams,” more Alaskan slang—behind which water will back up, causing flooding. 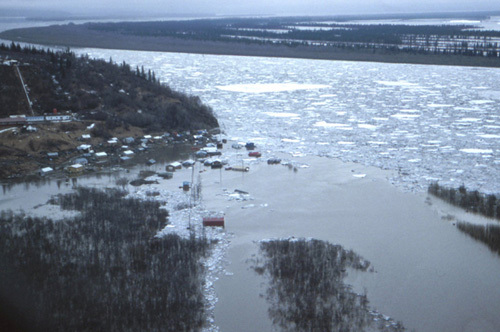 Along some streams, and along major rivers like the Yukon, the flooding can be extremely severe in many villages. That’s why for hundreds of miles, you’ll find all ears tuned in to KNOM’s daily detailed reports of breakup conditions, with flood watches and flood warnings. Thank you for making this vital, lifesaving service possible. Please consider adding KNOM Radio to your will. More than once, such sacred gifts have kept our mission alive during times of crisis. Also more than once, they have allowed us to make needed improvements that would otherwise not have been possible. Thank you! INSPIRATIONAL SPOT: Spirituality is not knowing what you want, but understanding what you do not need. INSPIRATIONAL SPOT: Unlike the latest fashions, friends don’t go out of style, and if you’re careful, you won’t wear them out, either. KEY MAN: (left) KNOM outreach director David Dodman was pianist for a Nome musical event raising money to help hospital patients in need. There was plenty of KNOM involvement, as former KNOMer Laura Davis sang, and 2001-2002 KNOM volunteer Ryan Conarro was up from Juneau to emcee. UP FOR THE COUNT: By the end of this month, KNOM will have broadcast just over 14,000 inspirational spots during 2010, and an equal number of educational ones, thanks to you. NEW EMT: We know you’re proud of KNOM’s volunteers, and here’s another accomplishment. Hat’s off to volunteer music director Leah Radde, who solidly passed the test, and in a fair chunk of her spare time, joins fellow KNOM volunteer Daniel Sylvester as Emergency Medical Technician I for the Nome Volunteer Ambulance Service. UP IN ARMS: Thank you if you wrote to inquire about John Francis’ arm, which he broke slipping on ice outside the studio this winter. You’ll be relieved to hear that John’s fully recovered. OUR FAIR LADIES: It’s hard to imagine any of these young women having any free time whatsoever, but in addition to all they do, KNOM volunteers Linda Maack, Danielle Sylvester and Leah Radde are all cast members in an amateur production of “My Fair Lady,” performing May 14th through the 16th. Q & A: How large is KNOM’s coverage area? If KNOM were located in New York City, places where between 76% and 100% of adults are daily listeners would be as far south as northern Virginia, as far north as central Maine and as far west as Pittsburgh, fully covering ten states. From listener response, we know that we have at least some listeners who would be almost as far north as Newfoundland, as far south as Savannah, Georgia, and as far west as Chicago, in portions of seven other states and five Canadian provinces. We would also be listened to in ships 1,000 miles out to sea. How far is Nome from the nearest highway? Nome is about 490 miles from the nearest point that connects with the North American road system. For some of the villages we serve, it’s more than 750 miles. Of course, we have many listeners in Russia, who are considerably farther! How many Masses has KNOM broadcast? About 13,000, thanks to you. INSPIRATIONAL SPOT: I can’t escape Your goodness, O God. You surround me like a gentle breeze. All of my idols live on in my life. My inconsistent values remain, my sin ever before me, but Your Love remains the same. I tremble in the face of such Love. Your reverence for me astounds me. You breathe hope. FORTY YEARS AGO: In May 1970, the group of radio volunteers includes two nurses who work at Nome’s hospital and contribute their entire salaries to the fledgling Catholic radio project. (Left) From left, Anne Legan, RN, and Jeannie Stoklosa, RN, help volunteer carpenter Leigh Birkeland with supper dishes. The mood is a mixture of gloom and hope. 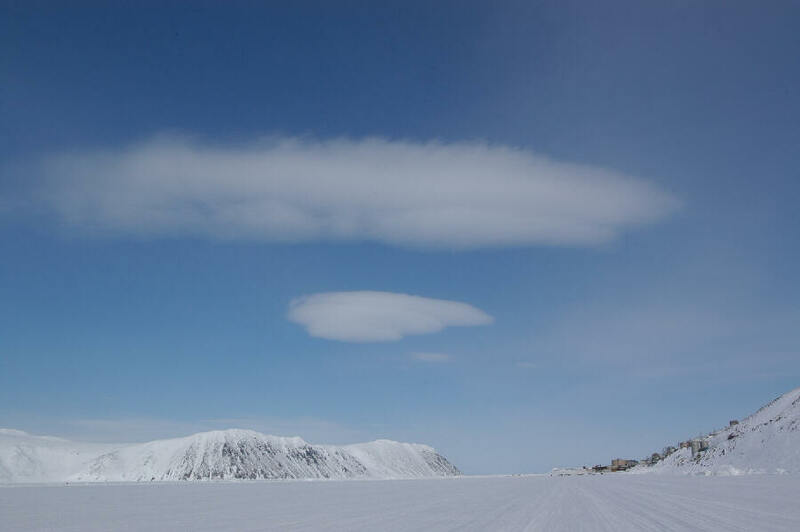 Alaska Native land claims have stalled the grant of a right-of-way to use the proposed transmitter site, which is federal land three miles east of Nome, and until it’s granted, the Federal Communications Commission is refusing to issue a construction permit for the new station. Most evening meals are reindeer meat, instant mashed potatoes and canned vegetables, with beef pot roasts a very occasional treat every few months. Lunches are canned tuna fish, canned chop suey and canned fruit, rounded out with lots of cornbread. A kind woman in Anchorage frequently mails out-of-date bread and cupcakes. Beverages are water, powdered milk and half-strength Tang. Eggs come by the case every few months via parcel post from Anchorage, and as they age, they take on extra flavor. (Upper left) The addition to the KNOM studio is almost closed in. With every square inch of room needed in the cramped structure, the inside stairs have to go and Leigh Birkeland adds an external stairway to the building’s rear. 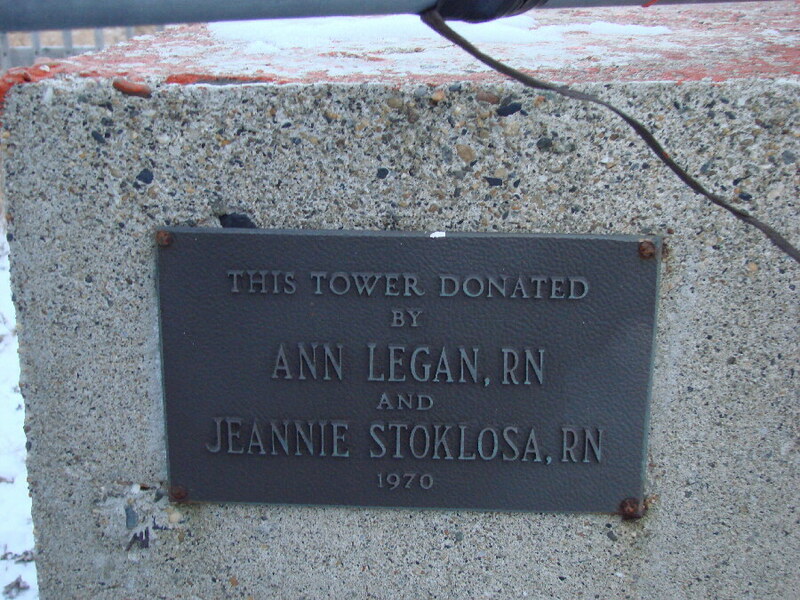 (Left) A plaque on the 230-foot KNOM tower attests that Jeanne's and Annie's gifts were dedicated to its purchase and construction. 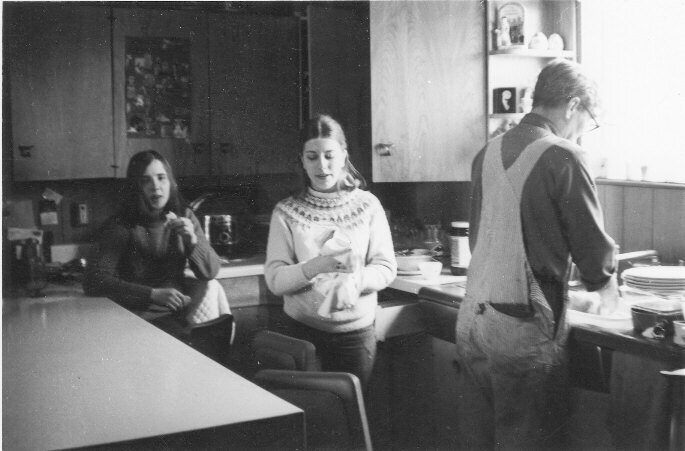 THIRTY YEARS AGO: In May 1980, volunteer news director Sue Boyle contributes eleven stories to the Associated Press, becoming Alaska’s top correspondent for the month, a KNOM first. TWENTY YEARS AGO: In May 1990, the KNOM studio building’s water pipes freeze and burst underground. Thankfully, the sewer line is okay. The June repair is $5,000. Meanwhile, fresh water is piped to the building using a garden hose laid on the ground. YOU CAN SEE that the KNOM mission has a rich history. Since 1966, some 300 selfless individuals have volunteered major portions of their lives to make its vital work possible. We thank you once more for your role in keeping this mission alive, as most adults throughout a vast area benefit daily from its inspiration, its education, its news and its companionship. As always, you and everyone you love remain in our daily prayers. Thank you again and God bless you! Copyright © 2010 KNOM. All rights reserved.